Most of us struggle with attention and focus from time to time, but when inability to concentrate becomes a daily occurrence we’re talking about a medical condition – more specifically ADHD (Attention Deficit Hyperactivity Disorder). The situation gets complicated when it is a pregnant woman who needs risky treatment involving amphetamine-based drugs, for example. The first line medications which combine amphetamine and salts (dextroamphetamines) such as Adderall are more or less safe to use in adults, but there are certain groups of people who should steer clear of these drugs. This includes people with pre-existing heart problems, high blood pressure, as well as women who take Adderall while pregnant or are breastfeeding. What is the Statistics Of Adderall Use During Pregnancy & Breastfeeding? Should Pregnant Women Use Adderall? What are the Dangers of Adderall to the Mother During Pregnancy? What are the Dangers of Adderall to the Fetus During Pregnancy? What are the Dangers of Breastfeeding While Medicating? How to Balance The Benefits? Recent studies have found Adderall has seen a massive increase in popularity among women, a staggering 750 percent rise between 2002 and 2010 to be precise. Can you take Adderall when pregnant? When it comes to Adderall and pregnancy, numbers significantly drop, but still reflect a substantial proportion. Out of 675 women in pregnancy surveyed in 2013, over 1 percent declared the use of the substance. This is a monumental surge of women who are pregnant and Adderall use, especially when you consider the 0.025 percentage for 2002. Can you take Adderall while pregnant? US FDA (Food and Drug Administration) labels the substance as a category C drug. It means there haven’t been enough human studies to confirm the drug’s harm on the fetus during pregnancy. Clinical studies conducted on humans are lacking for obvious reasons – risks associated with fetal harm throughout the pregnancy stages. However, those who involved in Adderall abuse on college campuses since young years are more likely to suffer from side effects in pregnancy than those taking medication as prescribed for treatment purposes. Is Adderall bad for you and your baby? There have been multiple animal studies which have shown it can have an adverse effect on the fetus during pregnancy in mice models, but it is important to remember these studies aren’t necessarily predictive of human reactions. In short, use of Adderall during pregnancy has not been proven safe. Still, as a category C drug, its potential benefits could prevail and warrant use in pregnancy. Implications are hard to predict for mothers who use Adderall. Pregnancy is synonymous with hormonal changes. For those in pregnancy struggling with ADHD, it can be particularly difficult to manage related symptoms – in most cases, they are exacerbated. Still, it is important to keep in mind each pregnancy is different and some women will actually find it easier to handle their use of Adderall while pregnant. Those who decided to quit this medication during pregnancy shall consult the therapist on how to cope with Adderall withdrawal fatigue. In animal testing, mothers who have been exposed to a heavy dose have had adverse effects on their fetus. It is impossible to predict the outcomes in humans at a similar dosage of Adderall xr 30mg, but it is safe to conclude use in pregnancy should be avoided, if at all possible. Those who have an ADHD diagnosis should ensure unplanned pregnancy is out of the question by using contraception pills and other preventative methods. Note there have been no proven adverse effects in use of Adderall and birth control tablets. Adderall and Breastfeeding – is it Safe? Can you take Adderall while breastfeeding? Because amphetamine is known to transfer into breast milk, a question of whether the drug is safe to use after pregnancy arises. If the use is inevitable, moms who take the drug should monitor the baby’ weight gain, sleeping patterns, appetite, and behavior closely. Should the baby show no signs of restlessness, insomnia, reduced weight, and other symptoms, a mother can continue to medicate. Otherwise, she should consider a different treatment strategy or hiring a nurse. There are a number of alternative drugs available, such as Concerta and Vyvanse. For more information, read about the difference between Vyvanse and Adderall or Concerta vs Adderall. Some human trials have observed how mothers react to Adderall while breastfeeding. Adderall appears to cause a significant reduction in serum prolactin. This hormone plays an important role in lactation and affects a wide range of bodily functions, including immune system regulation. If one suffers from the side effects and wonder how to stop taking Adderall, it is important to consult with the precribing doctor before quitting medication, or an addiction specialist if battling dependence. A mother needs to be mentally stable during and after pregnancy. In instances where the use justifies the risks to the child, a prescription should be maintained as instructed by the doctor. A controlled use is mandatory, though. Abuse in pregnancy and breastfeeding increases the risks and dangers to the fetus and to the mother during and after pregnancy. 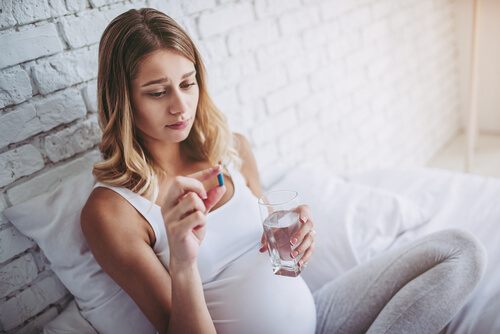 Individuals who find it particularly hard to quit the drug during pregnancy should consider enrolling in a substance abuse treatment program. There are many types of addiction treatment, however the future mothers need a specific approach with 24/7 supervision, such as in an inpatient rehabilitation facility. If you or your loved one are struggling with substance abuse and would like to discuss treatment options, call one of our professionals via our round-the-clock hotline service at (888)-459-5511.